There are plenty of attractive sightseeing spots on the walk course of Kiyomizu Temple from Yasaka Shrine !!!! On the way there are many meals such as food, miscellaneous goods, souvenir shop etc. First of all, start from Yasaka Shrine, the a symbol of Gion. 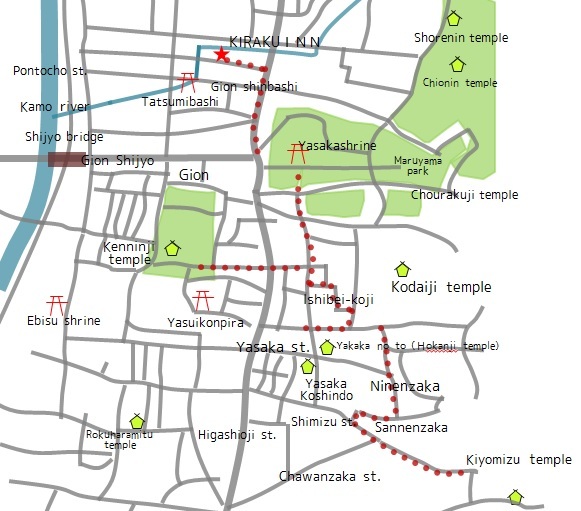 Yasaka Shrine is a symbole of Gion. It is famous 「the Gion Festival」the festival that represents Kyoto. It is crowded with many tourists every day.It is in the central location of the Higashiyama walking area.And many gods are worshiped besides Susanoo of the main god,the god of prosperous business, Ebisu. God of marriage, Okuninusi, Inari and so on. Recently kimono-shaped tourists are conspicuous. It seems that strolling in Kimono at Yasaka Shrine is becoming a standard staple of tourism. The road of Nene with a beautiful white wall from Yasaka shrine. From Shimogawara street to the Ishibeikoji street. Surrounded by stone pavement and board fence, the trail makes you feel the emotions of Kyoto. Kodaiji on a beautiful white fence. Beyond the rickshaw there is a view of the tower at Yasaka. A comfortable landscape spreads. Location atmosphere is radically changed. It is lined with a variety of shops on both sides of the cobbled streets. Souvenir goods shops and traditional Japanese sweet restaurants enjoy a stroll. Kannon of Kiyomizu-temple (the goddess of mercyis) welcoming gently all the people. It is welcoming gate of the Deva Kings and a three-story pagoda. And you can enjoy the Kyoto city view on the Kiyomizu Stage over a cliff. Stage feel of wood, Clear sound of the temple bell, and Green and incense fragrance wrap around the entire temple. Affection of Kannon (the goddess of mercy) is handed down through the five human senses. Feminine feeling Yasaka pagoda is the symbol of Gion. From Kiyomizu temple to Yasaka street. Yasaka pagoda visible from a narrow alley in the background Higashiyama is the symbol of Gion. And to Yasui konpira shrine.This shrine is known to kill the evil and bring you good match. Return is Hanamikoji walks.